When following a recipe that calls for fish, many customers buy exactly the weight of fish that the recipe calls for. What does the supermarket do with the fish that had to be trimmed off? They sell “fresh fish for chowder” at $3.99 a pound — at least at my local Harris Teeter that’s what they do! There may be bones in the fish! So run your fingers over the fish before cooking to detect the obvious bones that you can pull out. And eat slowly — always a good idea anyway! Do not use salmon in chowder. Use white fish only. If there’s salmon in your “fresh fish for chowder,” microwave (or bake) the pieces of salmon with lemon juice. Refrigerate (or freeze) the baked salmon. Then add to a fresh green salad with a few squeezes of lemon juice. Cioppino is one of my favorite foods. But until recently I only made it on special occasions. That’s because this delicious main dish fish soup was just too expensive for everyday meals. 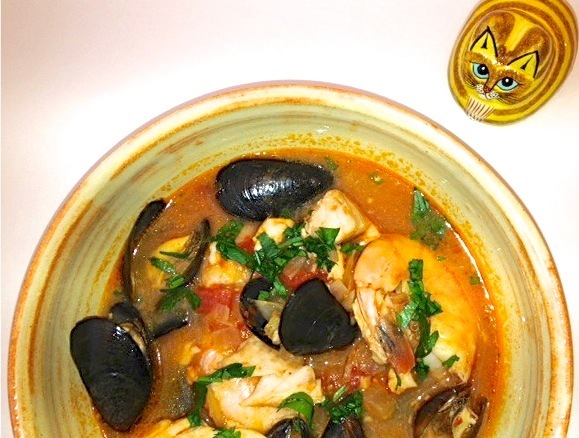 However, on a recent ordinary cold spring Sunday, I was craving something warm and just couldn’t get Cioppino out of my head. So I set out to find the best ingredients for an awesome Cioppino on the cheap. To save some cash, I didn’t include lobster, crab legs, or clams.But I used lots of mussels. In place of fish fillets, I used Trader Joe’s frozen boneless and skinless Mahi Mahi Pieces, for which I paid only $4.49 per pound. My Cioppino On The Cheap turned out absolutely great! A keeper! Hope you like it too! This recipe is adapted from Giada De Laurentiis’ Cioppino recipe. Her recipe was a great guide to ingredients and timings. When I made this dish recently (about a year after creating it), I thought it had too little broth. So next time, I plan to use more wine and clam juice (for a total of about 1 cup of wine and 3 cups of clam juice). This may make it a little less spicy, so I may need to adjust the red pepper by taste as I cook. After I try increasing the liquid, I’ll come back here and let you know how it worked out. Heat the oil in a large pot over medium heat. Add the fennel, onion, and shallots, and saute until the onion is translucent, about 10 minutes. Add the garlic and red pepper flakes, and saute for about 2 minutes. Stir in the tomato paste. Add tomatoes with their juices, wine, clam juice, and bay leaf. Cover and bring to a simmer. Reduce heat to medium-low. Cover and simmer until the flavors blend, about 20 minutes. Add the mussels to the pot. Cover and cook until the mussels begin to open, about 5 minutes. Add the shrimp and mahi mahi. Simmer gently until the fish and shrimp are just cooked through, about 5 more minutes. Stir gently. Discard any mussels that do not open. Season the soup, to taste, with salt, if desired. Ladle the soup into individual bowls and top each bowl of steaming Cioppino On The Cheap with chopped parsley. Clam juice: I really like Bar Harbor Clam Juice. It is not too salty, like many of the other brands of clam juice. Mussels need to breathe. When you get them home, take them out of the bag if they came in one (they suffocate in plastic)and put them in a bowl cover with a wet towel. Refrigerate. They will keep this way for up to two days. The organic frozen broccoli from Trader Joe’s is one of my favorites. I make my lunches ahead of time and freeze them in rectangular Pyrex glass containers with plastic lids. Then at lunchtime, when my office mates are heating up their Lean Cuisines or grabbing a bag of chips and a soda, I microwave my delicious – and nutritious – lunch!